Values indicate donations made by prominent Islamists listed in the Islamist Money in Politics database. Ahmad Al-Akhras (CAIR) is past president of CAIR-Ohio, and former vice chairman of CAIR's national board. Repeatedly defended Columbus men indicted -- and later convicted -- on terrorism charges. Yahya Basha (Muslim Public Affairs Council, American Muslim Council) was president of convicted terror financier Abdurahman Alamoudi's organization, the American Muslim Council. Yaqub Mirza (SAAR) is a money manager in several capacities, who was a key organizer of the SAAR Network of terror-supporting entities. Khurrum Wahid (CAIR) is the former legal advisor for CAIR national, and founder of Emerge USA, which grooms new Islamist leaders for participation in American politics. Safaa Zarzour (CAIR, ISNA) a Chicago lawyer, was first the president and chair of CAIR-Chicago, and then secretary-general of ISNA. Educational outreach by Islamist Watch: Islamist Watch attempted to contact the Clinton campaign by mail on September 21 at the first address listed on its website. The correspondence was returned and a new letter was sent to a different address on October 5. Result of contact: No response yet. Hisham Altalib (SAAR, etc.) was a close collaborator with Jamal Barzinji and played a key role in several Muslim Brotherhood-linked organizations, and is presently an officer of the Brotherhood front International Institute of Islamic Thought (IIIT). Jamal Barzinji (SAAR Foundation/ SAFA Trust) was a major participant in the founding of almost every national Muslim Brotherhood organization in the US. Yahya Basha (Muslim Public Affairs Council) was president of convicted terror financier Abdurahman Alamoudi's American Muslim Council. Esam Omeish (Muslim-American Society) is the former president of MAS, and was forced to resign from a Virginia commission on immigration in 2007 when video of a 2000 speech showed him praising "the jihad way." Islamist Watch sent a letter to Rep. Ellison on September 22, detailing the Islamist ties of some of his donors. Rep. Ellison has not responded to our educational outreach. Educational outreach by Islamist Watch: Islamist Watch sent a letter to Rep. Carson on September 27, detailing the Islamist ties of some of his donors. Result of contact: Rep. Carson has not yet responded to our educational outreach. Yasir Mahar (CAIR) is the president of the Executive Committee of CAIR-Los Angeles. Educational outreach by Islamist Watch: Islamist Watch will be contacting Senator Sanders shortly. Educational outreach by Islamist Watch: Islamist Watch sent a letter to Ms. Jayapal on October 14, detailing the Islamist ties of some of her donors. Result of contact: No response received yet. Educational outreach by Islamist Watch: Islamist Watch sent a letter to Rep. Duckworth on September 27, detailing the Islamist ties of some of his donors. Educational outreach by Islamist Watch: Islamist Watch will be contacting Mr. McMullin's campaign shortly. Kenneth Gamble AKA Luqman Abdul Haqq (MANA) was a musical legend in the 1960s who converted to Islam, and who has turned much of South Philadelphia into a Muslim enclave via cronyism with government officials and abuse of eminent domain to seize vast properties. Educational outreach by Islamist Watch: Islamist Watch did not contact Mr. Fattah, as he resigned from office following a criminal conviction. 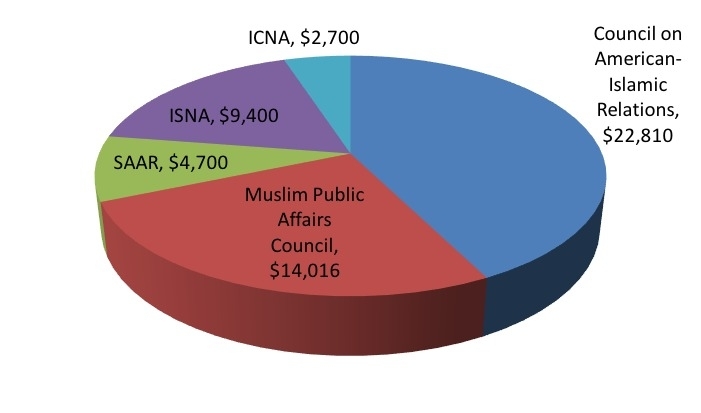 Educational outreach by Islamist Watch: Islamist Watch sent a letter to Mr. Evans on October 14, detailing the Islamist ties of some of his donors. Educational outreach by Islamist Watch: Islamist Watch will be contacting Rep. Edwards shortly.